Taking a break from holiday baking today to share this recipe for Chocolate Orange Gingerbread Muesli. Perfect for your Christmas morning breakfast or holiday brunching! How is everyone’s December going? Are you getting through your holiday to-do lists? So this year, I’m cleaning less and doing more Christmassy things! And obviously, baking is one of those things! So it’s been a few weeks since I actually posted a recipe for anything that wasn’t a sweet treat. Since mid-November, it’s been all things cookies around here. ‘Tis the season after all! But I couldn’t let the season go by without sharing the recipe for this Chocolate Orange Gingerbread Muesli. I’m a bit obsessed with breakfast and brunch these days, and with the holidays coming up, I love planning brunch get-togethers! Some of the dishes I’ll be including for my brunch gatherings this year include these cranberry white chocolate buns, this sweet potato breakfast skillet, and my raspberry french toast. While all these recipes are super delicious, and offer a mix of sweet and savory options (which is a must for any brunch! ), I wanted to include something a little different. Something healthy-ish, totally kid appropriate, and requiring minimal preparation. And if I can make something ahead of time and free up oven space, that’s a win! 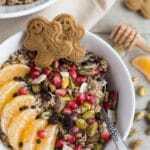 This Chocolate Orange Gingerbread Muesli is done in 10 minutes and you can make it right before serving it or even the night before. 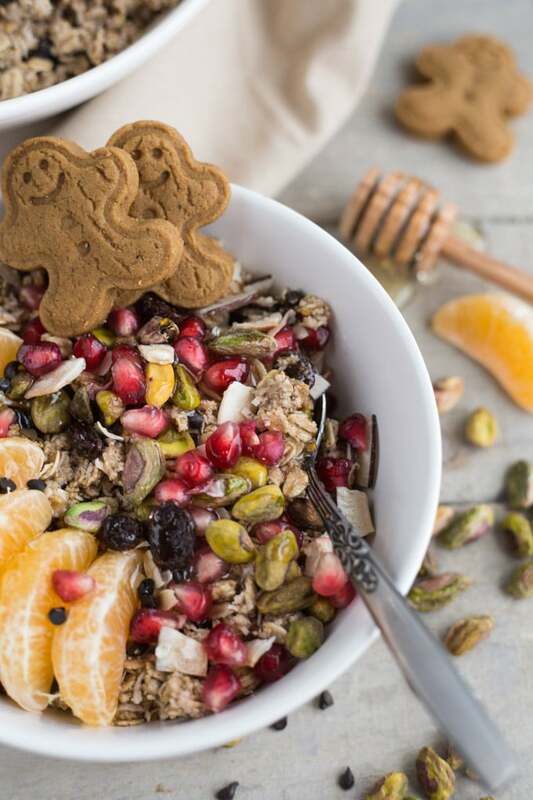 This muesli is packed with clean eating ingredients like rolled oats, quinoa flakes, sunflower seeds, raisins, coconut, spices, dried orange peel and mini dark chocolate chips. You just assemble the ingredients in a large bowl, add the almond milk (I used a mix of unsweetened original and dark chocolate almond milk) and let it sit for a few minutes. The longer you leave it, the more the flavours blend together. And surprisingly, it doesn’t get soggy if you leave it overnight! I like this for a holiday brunch option because it is chunky and filling, and a big batch goes a long way with a crowd. 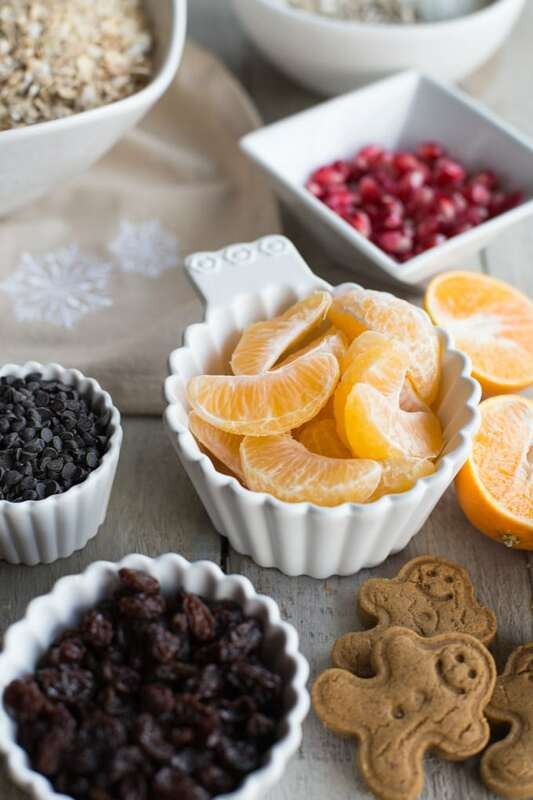 The spices and the orange peel add a nice holiday flavor, while the dark chocolate chips and almond milk add a hint of sweetness. This muesli really does taste like a chocolate orange mixed with gingerbread. 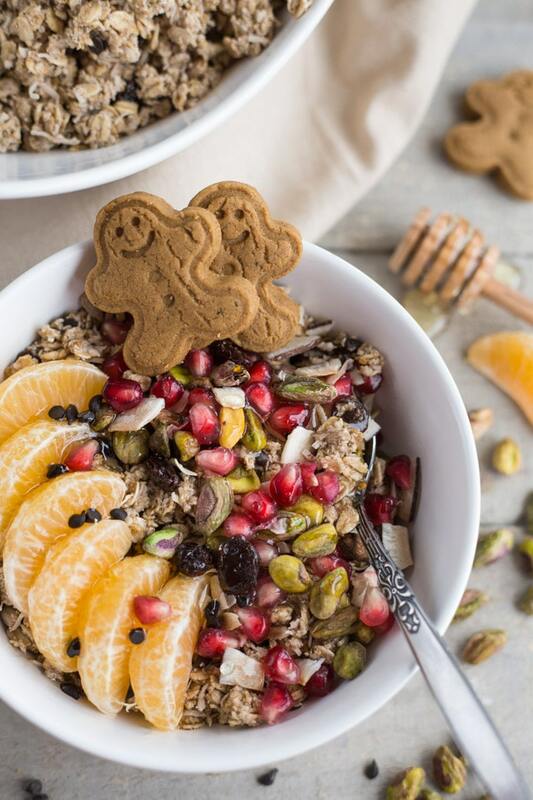 If you need a super quick, easy and clean eating breakfast recipe that tastes like Christmas in a bowl, you should probably add the ingredients for this Chocolate Orange Gingerbread Muesli to your shopping list! If you make this one over the holidays, be sure to share! And check out some of the other holiday recipes on my Christmas Cookies and Desserts Pinterest Board! 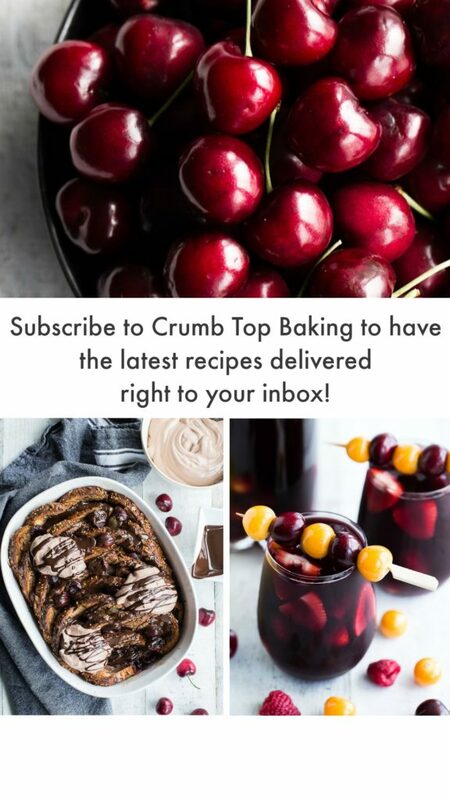 There are some goodies there from Crumb Top Baking and lots of other food bloggers! 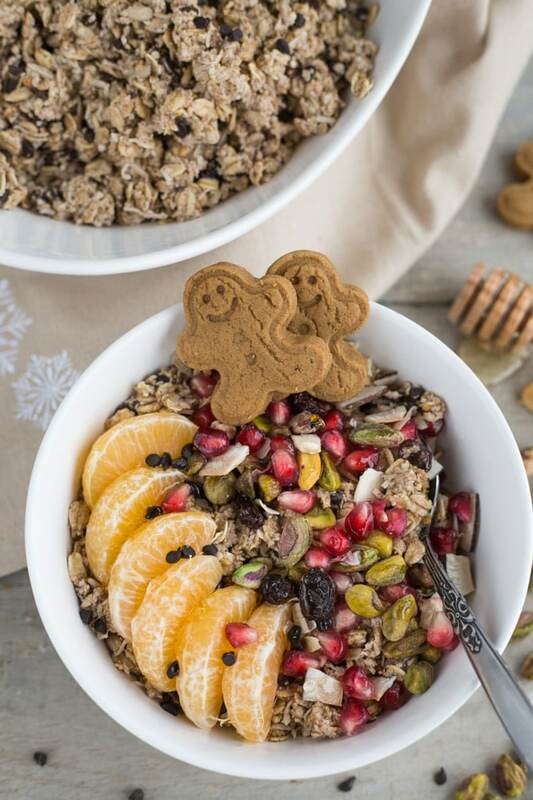 Chocolate Orange Gingerbread Muesli is perfect for your Christmas morning breakfast or holiday brunch. It’s wholesome, filling and packed with clean eating ingredients like rolled oats, quinoa flakes, sunflower seeds, raisins, coconut, spices, dried orange peel and dark chocolate chips. It can be ready in 10 minutes or you can even make it the night before! Add all the dry ingredients (everything but the milk and toppings) to a large bowl and stir to combine. Pour in the two kinds of milk and stir until well combined. Let sit for 5 minutes until the oats soften and absorb the milk. You can also cover and refrigerate for a few hours or overnight. 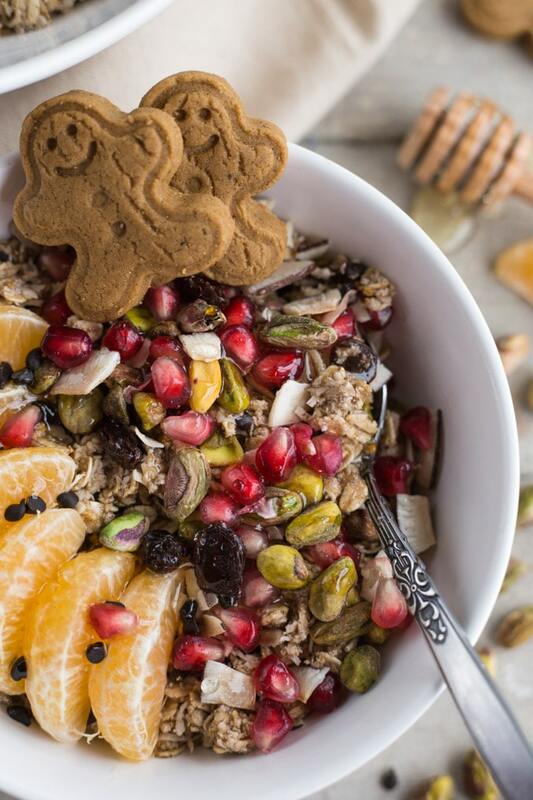 Scoop into bowls and top with pomegranate arils, pistachios, clementines, coconut chips and a drizzle of honey. Serve cold. Store any leftovers in an airtight container in the refrigerator and enjoy within 2 days. I get my dried orange peel at Bulk Barn. If you don’t have dark chocolate almond milk, you can use all unsweetened almond milk, or even use sweetened or vanilla almond milk (or another kind of milk). I like to add some of the dark chocolate almond milk because it sweetens up the muesli a little bit. I don’t enjoy muesli when it is too wet or runny, so I add just enough milk to soften the oats. If you like your muesli a little wetter, you can just add more milk. I like to serve and eat this muesli cold. If you prefer warm muesli, you could heat the milk before adding it to the muesli. But if you do this, leave the chocolate chips out as they will likely melt. You can just add them to the top of the muesli before serving. PINNED! Leanne, I think you’re my new favourite breakfast go-to blog. You and I both share a love of breakfasts!! I have to hold back from just posting all breakfast-related recipes. This meusli would be a huge hit around here – I think I’ll try warming up the milk first! Thanks Katherine! That made my day! I’m with you…I should have just started a breakfast blog! I could eat it for every meal ;). I hope you and your family like this one!! Let me know the verdict! Oh my! This is almost too pretty to eat – almost! 😉 I am with you – I have a strong love for breakfast and this recipe definitely strikes all the right chords! Delicious! Thanks Annie! 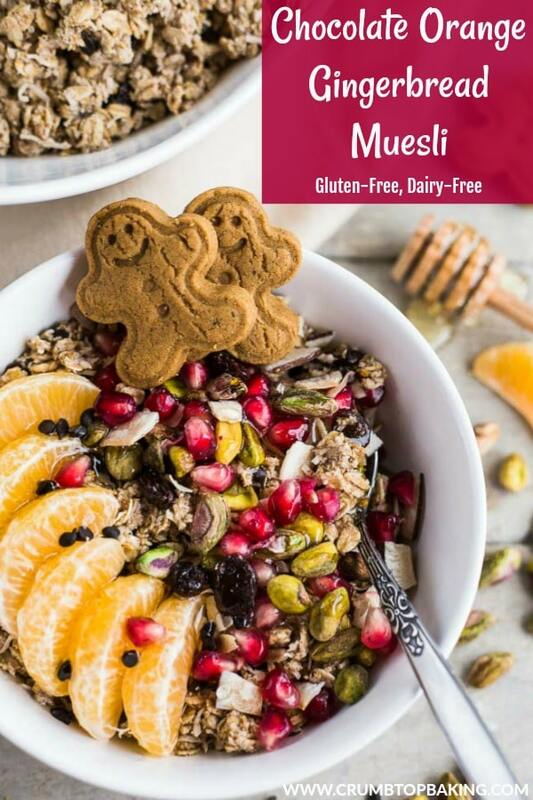 Breakfast is my fave meal of the day, and this muesli has been on repeat in my house lately – minus the gingerbread, of course ;)! I totally have that urge. I’m resisting vacuuming this morning because I have some baking to do. . .like it can’t wait until tomorrow! This muesli sounds delicious. I love gingerbread anything! Such an incredibly delicious looking bowl Leanne! Packed with all kinds of goodies I happen to love! Delicious! I have so much to do and this week for hubby and I is CRAZY busy. I mean, like, we have something going on all weekend. Well, even before that, really. I keep telling myself it will get done. As long as the house is decorated and is decently organized, I’ll be ok. The things we do to ourselves, right?? Anywho, this muesli looks delicious, Leanne, and oh so pretty! Love those little gingerbread men….cute touch! Thanks Dawn! It’s definitely crazy busy season! But you’re right, it all gets done! My goal is to get it done and keep my cool;). Hope you find some time to relax this weekend! Thanks Marcie! You must try quinoa flakes! They are great for muesli, granola, cookies, and probably countless other things that I haven’t tried yet! Let me know what you think if you try them! Enjoy the rest of your week!